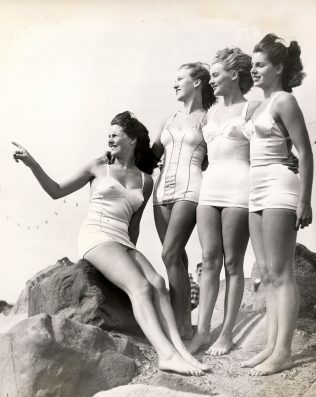 Ginny Marshall remembers the 1960s when thousands of tourists and locals used to flock to the beaches of Morecambe to spend their summer holidays frolicking in the sea and sun. 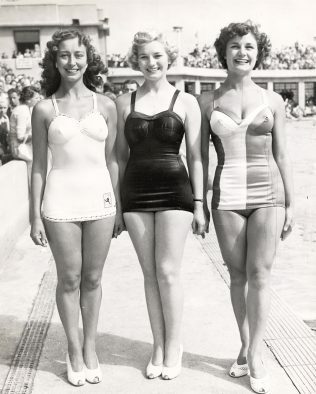 Ginny was a lifeguard at the Super Swimming Stadium, next door to the Midland Hotel, on the promenade. We used to have on a Wednesday afternoon Miss Great Britain competitions…they used to start queuing at about 11 o’clock and at one o’clock we used to open three turnstiles and there’d be three long queues… at the end of the season it would culminate in being the actual competition where Miss Great Britain would be crowned…I have memories of Englebert Humperdinck floating down the Morecambe Swimming Stadium on a four-poster bed being filmed for Irish television so obviously that was an amazing day. Eric and Ernie, Mike and Bernie Winters, Frank Ifield and Tommy Steele came to judge at the Miss Great Britain competitions. Local families would buy a season ticket and visited the pool as often as they liked. Great to hear your memories Roger. So many people have a connection to the Super Swimming Stadium but it is especially nice to hear from those who worked there and helped keep the place running. Maintenance work in winter sounds like a chilly job! Thanks for sharing. MBP. plenty to offer in those days.